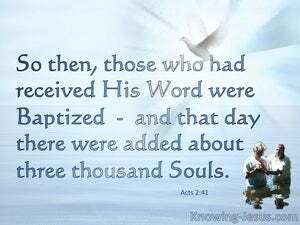 ﻿ Acts 2:41 So then, those who had received his word were baptized; and that day there were added about three thousand souls. So those who accepted his message were baptized, and that day about 3,000 people were added to them. So those who welcomed his message were baptized. That day about 3,000 people were added to their number. Indeed therefore those who received his word gladly, were immersed. And there were added in that day about three thousand souls. Therefore those who accepted and welcomed his message were baptized, and there were added that day about 3,000 souls. Then those who responded [by faith] to the words [spoken by Peter and the apostles] were immersed, and about three thousand persons were added to them [i.e., the apostles] on that day. Then they that gladly received his word were immersed, and on that day there were added to them about three thou sand souls. Then those who gave hearing to his words had baptism: and about three thousand souls were joined to them that day. then they that embraced his doctrine, were baptized: and there were about three thousand converts made that very day. Those then who had accepted his word were baptised; and there were added in that day about three thousand souls. So they welcomed his message and were baptized, and about three thousand people joined them that day. Then they, gladly receiving his word, were baptized; and there were added to them that day about three thousand souls. So that those who gladly received his word were baptized, and the same day there were added unto them about three thousand souls. Then truly they having gladly received his word were immersed: and in that day were added about three thousand souls. So those who accepted his message were baptized, and on that day about three thousand souls were added. Then those who gladly received his word were baptized. And the same day there were added about three thousand souls. Then they that gladly received his preaching were baptised; And the same day, there were added unto them about a three thousand souls. So those who accepted what he said were baptized; about three thousand souls were brought in, that day. So those who accepted his message were baptized, and that day about three thousand people were added. Then those who received his word were baptized. There were added that day about three thousand souls. They therefore received his word, and were baptized; and there were added on that day about three thousand souls. They, therefore, who welcomed his word, were immersed; and there were added, on that day, about three thousand souls. They therefore who gladly received his discourse were baptised: and there were added to them that day about three thousand souls. Then they that gladly received his word, were baptized: and the same day there were added to them about three thousand souls. Then those who gladly received his word were baptized. There were added that day about three thousand souls. 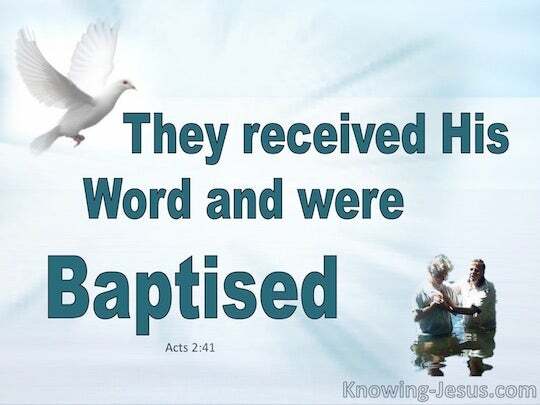 They therefore that received his word with readiness were baptized: and in that same day there were added unto them about three thousand souls. 40 And with many other words he solemnly testified and kept on exhorting them, saying, "Be saved from this perverse generation!" 41 So then, those who had received his word were baptized; and that day there were added about three thousand souls. 42 They were continually devoting themselves to the apostles' teaching and to fellowship, to the breaking of bread and to prayer.